ISBN 978-1-937794-08-8 (epub) available for iPad, Nook, etc. from Barnes & Noble (USA), Chapters Indigo (Canada), Goodreads (USA), Kobo (USA) and Weightless (worldwide; US currency). ISBN 978-1-937794-06-4 (mobi) available for Kindle on Amazon (BR, CA, DE, ES, FR, IN, IT, JP, UK, USA) and at Weightless (worldwide; US currency). ISBN 978-1-937794-07-1 (pdf) available at Smashwords and Weightless (worldwide; US currency). A blueshift is a decrease in wavelength caused by the motion of an object towards the observer, most commonly experienced in the Doppler effect. Clocks and galaxies and streetlights; urns and deadbolts and petroglyphs; sweating lemonade; contrails; the spider strings of memory; rocky winter ground, the great blue heron with its neck tucked up under it like a wish, and the vanishing stars: Heather Kamins‘ inaugural chapbook of poetry reveals a deep curiosity and insight into the repressed and irrepressible energies of our world. as snow threatened to descend. “Eggcorns,” Autumn Sky Poetry, Number 19, October 2010. “De Omnibus Dubitandum,” “Entropy” and “Prevailing Winds,” Neon Literary Magazine #27, Summer 2011, pp.23-25. In “Insomnia,” the poet continues that sense of wonder. Instead of filling the poem with frustration and difficulty (as so many sleepless nights feel), she talks about those delightful sounds that one only hears in the dark: “ceaseless polyphony” or the breathing of a lover. I was delighted with the sense of awe that rose through lines like this one: “wild neurons / weaving the spider strings of memory.” In the end, the speaker asks: “How can I sleep / in a world so full of such things?” The poet makes me wonder the same thing and perhaps the next time I’m lost at 2 am, wakeful and unhappy, I’ll stroll through the dark and remember to look around me with awe instead of dismay. …As a reader, I wanted more poems, more of Kamins’ beautiful imagery and wonder. First of all, of course, the reader notices the lushness of all that alliteration: children, churches, itchy, change, chess, benches. (Kamin backs off that heavy sound as the poem progresses, which is probably for the better.) And then that line break “tentative / lovers” that illustrates with the imposed pause the hesitation of these lovers. And, in a poem called “Blueshifting,” you have to notice that these lovers are “waiting for the light to change” — waiting for the hello to become the good-bye. …Much delight in this slender volume. Well worth the $4.99 cost of a download. — Sherry Chandler, “Exploring the blueshift on the Couplets blog tour,” 24 April 2012. There is much to ponder in this collection. The recurring scientific imagery is used to make observations about our relationships to each other, the natural world and the universe as a whole. These themes are poetic staples, but that doesn’t mean there is nothing new to say about them. In particular, the scientific theme helps dissolve the artificial divide between science and art. — Jason Jawando, “Review: ‘Blueshifting’ by Heather Kamins,” Neon: A Literary Magazine, March 2012. In some ways, the gist of her poetry is reminiscent of the phenomenon of peripheral vision in which you’re positive something has slipped into the perimeter of your consciousness only to vanish before you can fully register what it is. In Kamins’ world, places and happenings may be presented with telling precision but everything is on its way to becoming something very different or at least affecting the narrator in a very different way. This is, in brief, a cool, intellectual exercise in poetry that I enjoyed much more than I expected to, which is quite an admission from a Byron man. — Robert Hewitt, “Poetry and life enhancement…,” 11 March 2012. One twist in the path, which maybe defies scientific analysis even more than love, is humour. Kamins keeps the all-powerful governing metaphor at bay with a gentle sense of humour and genuine wit. Eggcorns, for example, is a funny poem of malapropisms. And Devolution inverts our expectations by sentimentalizing garbage and smog and expressing indignation at the threat of an encroaching nature. And my favourite of the collection — Headspace — lulls us into a saccharine state of mind, sitting next to grandmother, perhaps on a farm, learning how to make jams or preserves the old-fashioned way, until we discover that this is a case of ‘borrowed nostalgia’ and our narrator is, in fact, in a classroom making it all up… projecting the good old days when poetry was a rustic pleasure passed on to us by our grandparents. Maybe this is Kamins poking gentle fun at the whole debate. And with beautifully crafted poems in a tight, cohesive collection like this, we’ll grant her that indulgence. 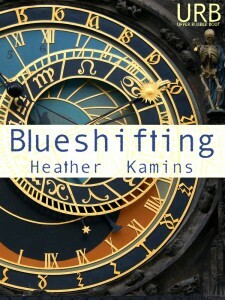 — David Allan Barker, “Blueshifting, a poetry chapbook by Heather Kamins,” nouspique, 31 January 2012. These poems, these concepts are aimed at coming towards the reader, bringing things closer, connecting sandwiches and lightwaves and grocery lists… I’m adding Heather Kamins to my list of poets to keep an eye on. — Marissa Lingen, “Blueshifting, by Heather Kamins,” Barnstorming on an Invisible Segway, 1 January 2012. Entry filed under: Poetry. 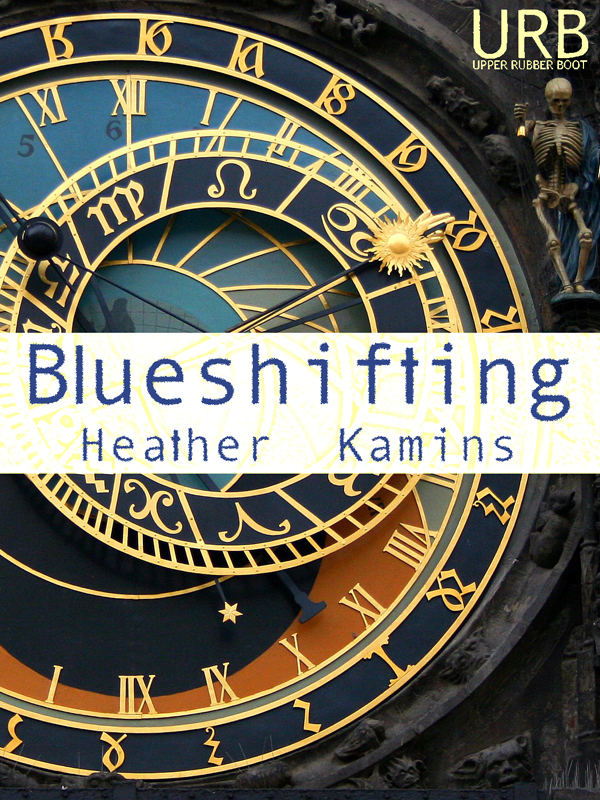 Tags: Blueshifting, Heather Kamins.